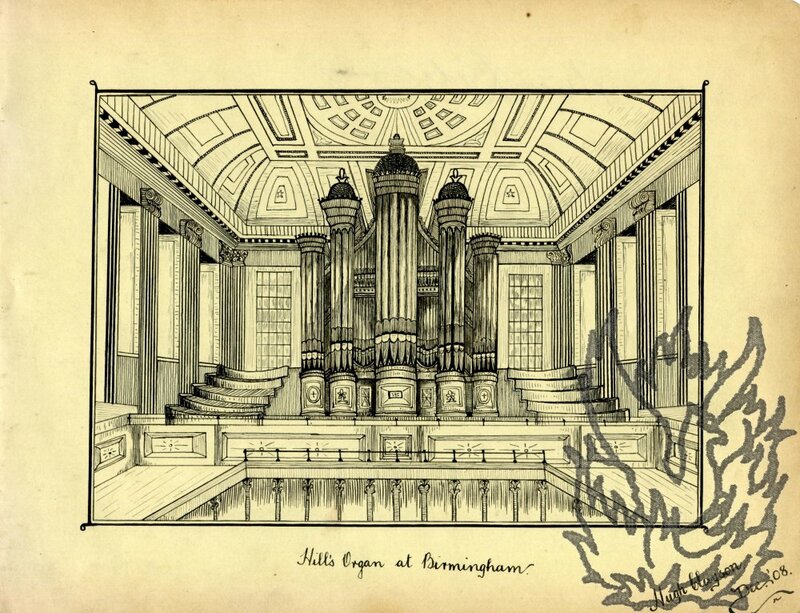 Detailed pen drawing captioned 'Hill's Organ at Birmingham'. Signature of Sir Oliver Lodge on reverse. Signed 'Hugh Clayson. Dec. '08'. On a piece of yellow paper, 18 x 23.5 cm, removed from an autograph album. Dimensions of image 12.5 x 17.5 cm, neatly enclosed within a border. Good, on aged paper discoloured at extremities of margin. 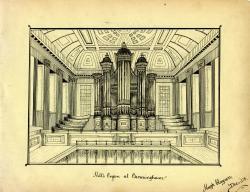 An accurate and detailed drawing of the organ in its setting on the balcony, with ceiling above and the surrounding steps, columns and alcoves. Autograph Letter Signed to Don Wauchope. 10 January 1891; on letterhead '86, CANONBURY ROAD'. Engineer (1865-1941) whose inventions include the speedometer for motor-cars. Two pages, 12mo. Good, though slightly grubby. Docketed on reverse. Small ink smudge beneath letterhead. Reads 'Dear Don Wanchope | Thanks for your letter. My full name is/ | George Keith Buller Elphinstone and by profession I am an Electrical Engineer & Maker of Electrical Instruments | So I hope that will be full enough information for you'. Signed 'G K B Elphinstone'.